Jonas Malakiasen doing a dance on the beach before he inaugurates my new tuilik. Immediately after the race was over we moved on to the rolling — only Enoch, Johan and Hendrik, as it was such a cold day. A fine display from Enoch, I filmed it all [with the defective camera, so all for nothing] and he carefully did them one by one for this. Johan was not on form and eventually wrenched the tuilik from the coaming of the kayak and got soaked. Hendrik very good at the sculling braces and also managed the elbow stroke for the first time in his life! Enoch took my tent as first prize; Hendrik a toy submarine for his son as second; and Johan a primus stove for his grandson Bintsi. He was so delighted with this. A day or two later, at Sakeus’ where the trophy which Drever had given to the village was for safekeeping, Enoch watched as I carefully engraved “Enoch Nielsen 1959” on the front of the trophy. He was immensely proud, spoke of how his son would show it to his friends at school! Maybe because I already had the still photos taken on that earlier occasion (September 23) I didn’t take any photos on the day of the race. So all the photos shown here are from that earlier day. But first a word about kayak rolling in general. 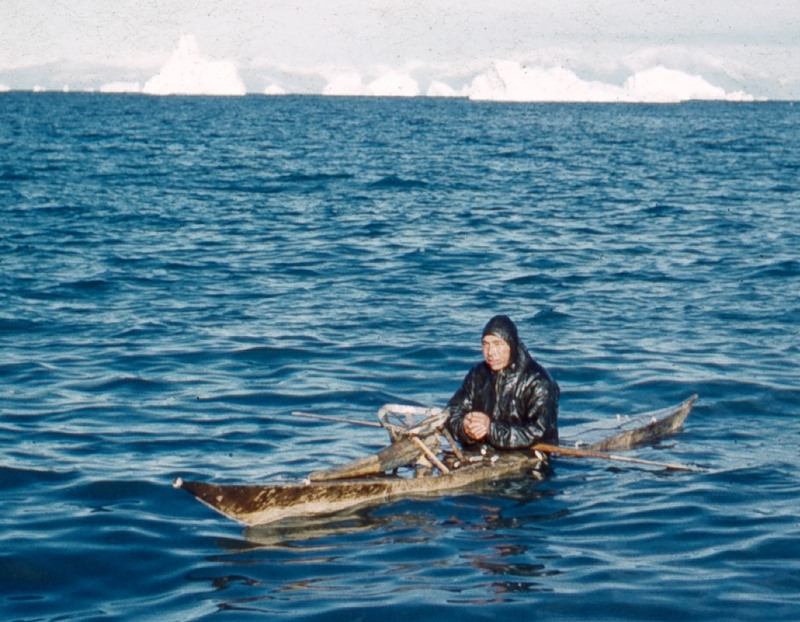 Kayak hunting, in the Arctic and sub-Arctic, has always been a dangerous thing to do. From the waves created by an iceberg breaking up or turning over to a new position of stability, from the risks of attack by a threatened or wounded sea mammal, from accidental entanglement in the harpoon line, from the wild seas of storm conditions, there has always been the possibility of a kayaker being capsized. Since getting out of the kayak to save yourself, if you were alone, was never an option due to the extreme coldness of the water, the Inuit of Greenland and their relatives all the way across the Arctic and down to the Aleutian Islands of Alaska, had developed a number of ways to bring themselves back upright after a capsize. “Kayak rolling,” as we call it, has been observed and commented on from the earliest times of outsider contact with the Inuit of Greenland. First he describes what we nowadays call side and chest sculling braces in which you catch the kayak when only halfway over and return it to the vertical by sculling the paddle blade back and forth. Next, eight rolls using the paddle to recover from a full capsize. These are: (1) recovering with “a swing of the pautik [paddle] on either side,” what we nowadays call the standard sweep roll; (2) with one end of the paddle under one or more of the fore deck thongs and “a quick motion of the other end;” (3) “they take hold of one end of the pautik with their mouths, moving the other with their hand;” (4) with the paddle held “across the nape of the neck;” (5) with the paddle held “behind the back;” (6) with the paddle held over the shoulder; (7) with the paddle held under the bottom of the kayak with both hands; and (8) by leaving the paddle on the surface of the water and then pulling down on it once capsized. Then, three rolls without the paddle: (1) using the throwing stick; (2) or a knife; (3) “or even the palm of the hand …” Of this last he remarks that it “rarely succeeds.” So, though he is usually cited (quoted) as speaking of ten ways of rolling, in fact he lists the two sculling brace maneuvers and twelve ways of rolling (The History of Greenland, English language edition, 1820, pages 140-141). Most of these maneuvers are well enough known nowadays and are included in the 35 performed at the annual competitions of the Greenland Inuit kayaking association Qaannat Kattuffiat [QK]. (1) the roll with the end of the paddle under the deck thong(s), though something very similar was known in East Greenland (see below). “You cannot rank as an expert kaiak-man until you have mastered the art of righting yourself after capsizing. … A thorough kaiak-man can also right himself without an oar by help of his throwing stick, or even without it, by means of one arm. The height of accomplishment is reached when he does not even need to use the flat of his hand, but can clench it; and to show that he really does so, I have seen a man take a stone in his clenched hand before capsizing, and come up with it still in his grasp” (1893, pages 52-4). Two other valuable sources of information were Spencer Chapman’s “Northern Lights” (1934a) and his “Watkins’ Last Expedition” (1934b). These are his reports on the two expeditions to East Greenland led by Gino Watkins in 1930-31 and 1932-33. His accounts were especially interesting to me as Watkins, Chapman and others learned to kayak and to roll their kayaks. Chapman reports that “only about one in four of the hunters [could kayak roll] … the more skillful … had a great many ‘trick’ rolls. … and about half a dozen in the whole Angmagssalik district — have learned to roll … with the hand alone.” Seven of the expedition members learned to roll but Watkins was the only one who could do so [at that time] with the throwing stick or with the hand alone (1934a, pages 204-205). When he returned to Greenland on the second of these expeditions, Chapman continued his kayaking and added to his rolling skills: “[One day] I managed to roll in eight different ways with the paddle, then for the first time I came up with my hand alone” (1934b, page 303). Tragically, it was on this second expedition that Watkins, while out alone seal hunting by kayak (something that he loved to do), had an accident of some sort and was drowned. The others found his kayak but they never did find his body. During my years of sea kayaking back in Scotland, while of course we knew of kayak rolling as a skill that the Inuit had developed, this was simply not a part of what it was all about for us. I never heard of anyone even thinking of trying to roll our beamy Scottish kayaks. For us rolling was just that amazing thing that whitewater kayakers did. When I wanted to learn at least the basics of rolling a kayak before I left for Greenland, it was with the help of some whitewater kayakers that Campbell had met that it happened. Campbell was able to borrow a whitewater kayak for an evening and, in the Glasgow Western Baths swimming pool, he and I managed to teach ourselves how to do the “Pawlata” or basic sweep roll (the Standard Greenland roll). I was glad that we had as I did need to know that roll the time I capsized in Ludwig’s kayak and was able to roll at least part way up three times and (finally!) be rescued by Karli Zeeb (see my “Illorsuit Adventure” article in QajaqUSA’s newsletter MASIK, Spring/Summer 2009 issue). While I was in Greenland none of the hunters I knew ever needed to roll. But I did learn of a few kayaking accidents. The highest peak on Upernavik Island visible from Illorsuit, so Drever told me, had been named Paulus Peak in memory of Johan Zeeb’s younger brother who died while kayaking. Kent describes witnessing the rescue, in view of the village, of a hunter called David who capsized when a Harp Seal he had harpooned off his left bow dragged his harpoon line across the kayak and pulled him over. He also tells of how a man he knew called Peter was “lost at sea. They found his kayak later, torn to shreds. Only a walrus it is thought, could have done it” (Salamina, pages 105-6 and 330). But some of the men were willing to roll when I asked them to, as a demonstration. Whatever practicing and/or training of novices happened that summer, it was all over and done with before I even arrived at Illorsuit in early August. There was in fact a special kayak in the village used for training boys aged 8 to 10 years old to kayak (though not to roll). Hendrik Korneliussen was the villager employed to provide this training. Unfortunately, I arrived too late in the summer to see this being done. The second time that I asked people to put on a demonstration that I could photograph — actually to take part in the competition we held on October 14th, the day of the race — several men said “thanks but no thanks” … already the weather was just too cold. Enoch Nielsen, Illorsuit’s champion roller, was always keen on the idea so once that beautiful full jacket (“tuilik“) had been made for me by Tobias’ wife Emilia with the ivory buckles and hooks done by Enoch himself, we had two fine sessions of kayak rolling. Apparently no-one else in the village had a “tuilik” (it was mid-September by this time) so my brand new one would be used. Jonas Malakiasen, Johan Zeeb, Enoch and I did the rolling that and the next day. … and making sure it was tight around his face. The dead eye at waist level is part of the “suspender” arrangement for when (in the old days) a kayaker wanted to shorten the length of the jacket while out hunting for example and not at that moment using it to roll. With one pull to let the bone or ivory hooks on the thongs coming over his shoulders slip through the dead eye he could release the “suspender” and have the full length of the jacket free to allow him to move his body as needed for whatever roll or rolls he needed to do. As I’ve mentioned in Chapter Seven on The Hunting Equipment, Petersen (1986) tells how important, in fact essential, for successful kayak rolling it was to have the jacket opened out to its full length. Jonas went first and did some side and chest sculling braces with no problem but when he went over to do a full roll he lost his grip on the paddle and floundered badly. Someone was able to quickly go out in a boat to help him but by that time he was half out of the kayak and got his pants soaked and the “tuilik” wet. Martin Zeeb had been planning to do some rolls but now didn’t want to because of the “tuilik” being so wet. But then Johan showed up and agreed to try, to my surprise as he was about 57 years old and a “retired” kayaker. He gave us a thoroughly expert display of three or four different rolls and both sculling braces. The next day it was Enoch’s turn — the champion. So I began by filming him doing several rolls. As I’ve already mentioned the camera turned out to be defective so, of course, that was a waste of time and opportunity. He must have run through his repertoire quickly giving me only time to get it all (supposedly) with the movie camera. It then took some persuading to get him to go out again and I was only able to get these few still photos. Here he is squeezing himself into his kayak before his first set of rolls. Notice that, as was always the case when anyone demonstrated rolling, he has the harpoon line tray and gun bag in their normal place on the fore deck. At least eight of the 18 active kayakers had the front end of their gun bags attached to a special loop of skin permanently stitched to the deck of the kayak. As everyone always did, he “warmed up” first with some side and chest sculling braces. It seemed that all the kayakers knew both the side (on your back) and the chest sculling brace techniques. In fact, one man said that he was so good at these that he didn’t need to learn the “real” rolls. If that sounds a little strange, it’s worth remembering that two of the rolls in Enoch’s repertoire use these sculling techniques to recover from a fully capsized position. Beginning his recovery from the chest sculling brace. Enoch and everyone else at Illorsuit did the chest sculling brace with both thumbs pointing at the tip of the paddle. At the Qaannat Kattuffiat championships , “some judges allow [this], but in 2003 you were required to keep your normal paddling grip” (see Capsize Maneuvers Performed at the Greenland Kayaking Championships, http://www.qajaqusa.org/QK/rolls/html). Which is what I saw being done, and it was the first time I’d ever seen this, by members of QajaqUSA at Delmarva in 2004. Going over to perform a basic sweep roll (the Standard Greenland Roll), his paddle close up against the bow of the kayak. Now fully capsized, paddle still close to the bow, both hands at the water’s surface, ready to begin the sweeping recovery. One thing that really impressed me was that Enoch and other men too could do this roll so well that they would be upright again with the paddle having swept through only some 25 to 30 degrees. They would then turn the paddle over to a low brace position and complete their recovery bent over the fore deck. While this may not always have been the case, in the rolling that I saw in 1959, they never completed leaning back on the after deck. At the QK championships nowadays when you do a Standard Greenland Roll you are expected to “finish leaning aft [but you] are optionally permitted to finish in a low brace, sweeping forward, as shown in the video clip” (see qajaqusa.org). Given that they had that level of skill, they also did the side sculling brace with their paddle kept close to the bow of the kayak — again sweeping out from the bow only those 25 to 30 degrees. Recovering from a hands together in the center roll. It looks like he almost overdid it! Recovering from a “paddle held in crook of elbow” roll. Soon after I returned from Greenland Drever arranged for me to visit the Scott Polar Research Institute in Cambridge, England, where I was shown films of Watkins and other of his expedition members performing some of the rolls they had learned in East Greenland. Especially interesting was to see the East Greenland version of one of the rolls that Enoch had shown me in Illorsuit (more below). In the early 1960s, when John Heath and I were working on what in due course became his Appendix on “The Kayak Roll” in Adney and Chapelle (1964), I sent him detailed descriptions of the full list of rolls that I had seen and learned of and heard about at Illorsuit. For some reason (I’m not sure that I ever did learn what that reason was) that information didn’t make it into the final text, though six of my photos (one of Jonas and five of Enoch) were used. Heath gives a fine introduction to the art of kayak rolling in which he quotes Crantz (1767) in full and it was in this Appendix that he first published his brilliant “turn the page upside down” drawing (on page 224) of how a basic sweep roll is done. Here is the updated version, where he “turns the page” for you, on page 24 of his and Arima’s Eastern Arctic Kayaks (2004). Qaannat Kattuffiat, the Greenland Kayaking Association, was founded in 1985. It now holds an international kayaking competition in a different town in West Greenland each year. At these, in addition to various races, Inuit and foreigners compete in performing 29 different kayak rolls and six related maneuvers. Manasse Mathaeussen, who died in 1989, had known all of these maneuvers and taught others any that they wanted to learn. It was Manasse, by the way, whose family was living in East Greenland at the time, who taught Gino Watkins how to roll (see Heath 1990). QajaqUSA (which is the American chapter of Qaannat Kattuffiat) gives a description of all of these 35 maneuvers, with video clips of several of them, on its website (see reference above). So, 29 different ways of rolling a kayak. That sounds like a lot I know but, as Martin Nissen says, “kayak rolling has developed into a discipline in its own right … while many methods of rolling developed from hunting needs, other ways of rolling have developed simply because they can be done, and they are fun” (2012, page 3). (1) a sweep roll beginning with your arms crossed, paddle at the stern of the kayak, first sweep downwards, uncross your arms, sweep back to the stern, end leaning foward. (2) a sculling roll with the working end of your paddle reaching only to the tip of your elbow. (3) a sculling roll with the middle of your paddle under a longitudinal fore deck thong (this is obviously similar to Crantz’ “[one end] of the pautik among the cross straps of the kaiak”). (4) a sculling brace where with the kayak on its side, you reach over the kayak and by sculling on the other side you can hold the kayak in that almost 90 degrees from vertical position. (5) what non-Inuit recreational kayakers nowadays know as the “balance brace” where you lie with your back in the water, paddle on the surface, and without moving your paddle hold that position. (6) the same as #5 but face down in the water. In 1990 John Heath published, in Sea Kayaker, an obituary for Manasse Mathaeussen. 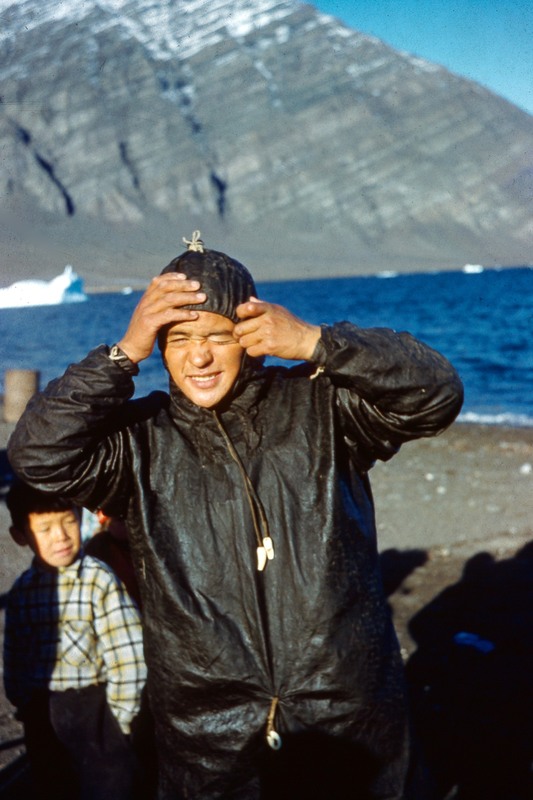 For years Manasse had been the undisputed dean of Greenland Inuit kayaking and kayak rolling. I’ve mentioned what an invaluable resource he was in the bringing into being of Qaannat Kattuffiat in the mid 1980s. In his article in Eastern Arctic Kayaks (2004), Heath gives extremely detailed descriptions of 41 kayak maneuvers (most of them kayak rolls) known in West Greenland. With the exception of five variations of other rolls on the list, these include all of the 29 actual rolls performed at the QK competitions. He also describes the roll with one end of the paddle tucked under the fore deck thongs listed by Crantz. Included in Heath’s article is a series of excellent, step-by-step, close up photos, by Vernon Doucette, of Pavia Tobiassen and Ove Hansen, both from Greenland, performing eight of the rolls discussed. Martin Nissen (a past president of Qajaq København, the Danish chapter of Qaannat Kattuffiat) published a definitive account of the history of kayak rolling in West Greenland in the Sea Kayaker magazine of August 2012. Among much else, he describes how it was demonstrated numerous times in Europe and eventually learned by a number of Europeans and others. Back in the 1920s, it was Edi Hans Pawlata, an Austrian sportsman, who became the best known of the Europeans who learned to roll a kayak. As I’ve mentioned above, we still speak of the “Pawlata” roll, his version of the standard Greenland Inuit sweep roll. Volume Four (2009) of QajaqUSA’s journal QAJAQ is devoted to a translation of an article by Pawlata and one by a Franzl Schulhof with information on their involvement in making known and popularizing the art of kayak rolling. Enoch either demonstrated or told me of both the side and the chest sculling braces as well as 19 different ways he knew to roll a kayak. Eleven of these 19 (as I now know) are included on the list of rolls to be performed at the Qaannat Kattuffiat championships. But he also knew eight other rolls. In fact, what seemed to be his favorite “trick” roll is not on the QK list. In this, which was a sweep roll, he would grip his paddle so that the end of the blade he was about to roll with reached only as far as the tip of his elbow. (11) the storm roll (not seen) [QK #5]. (18) from fully capsized, use side sculling to recover, with paddle at water’s surface (demonstrated); (19) from fully capsized, use chest sculling to recover, again with paddle at water’s surface (demonstrated) — Enoch did this roll by falling forward to capsize, in East Greenland it was done by falling backwards (which is how I assume both Heath and I saw it done in the films at the Scott Polar Institute). Oddly enough, this way of rolling is not mentioned by Victor. Years later, in Madison, Wisconsin, this Steyr-like roll that Enoch had taught me became my favorite. For me, it was the easiest and the most elegant of them all. I’ve already mentioned a particularly interesting thing about rolling as done at Illorsuit in 1959 — forgive me if I repeat it here. The Illorsuit kayakers always completed their roll recoveries bent forward over their fore decks. They did not complete their rolls leaning back on their after decks. I was puzzled when I first saw this technique used with great care by QajaqUSA kayakers — at Delmarva in 2004. And then I learned that this is how you are expected to complete seven of the rolls at the Qaannat Kattuffiat competitions in Greenland. And three of the rolls described by Victor for East Greenland also have this feature. I was told about two other ways of rolling. Sakeus Bertelsen the village catechist and school teacher told me that in the Upernavik District (immediately to the north of Uummannaq), where he had lived for a while, some hunters could roll using their harpoon shaft instead of a paddle. 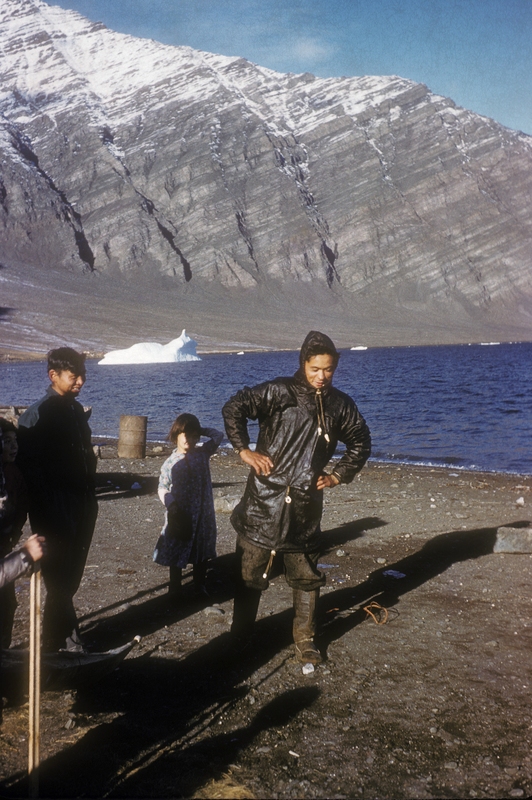 And various of the Illorsuit villagers knew that Manasse, at that time living at Saqqaq in the Vaigat District on the south side of the Nuussuaq Peninsula, could roll by sweeping with his two hands, in kayaking mittens, held side by side. Of the eighteen active kayakers in Illorsuit, in 1959, fourteen could roll and most of them by a number of methods. Three men could roll by more than ten methods. Four kayakers could not roll, though they could do the side and chest sculling braces. Two of these four were young hunters who had been kayaking for only one or two seasons. The six older men in the village, who no longer kayaked, were all said to have been skillful kayak rollers in their younger days (I’ve already mentioned Johan Zeeb, one of these six, who rolled so skillfully that day in September). Enoch recovering from an after deck roll (the Steyr-like one). You can see he has both hands in low brace position and he’s about to complete by leaning forward over his fore deck. And here, of course, trying to warm his hands back up again. So … I was duly impressed! Compared to what I had read up until that time (in Crantz, Nansen and Chapman), Enoch’s ability to roll his kayak in 19 different ways struck me as being definitely impressive. I only wish there was information on the traditional rolling skills of other individual Greenland Inuit hunters to compare with Enoch’s. But, to the best of my knowledge, there is no such information available in any source. Except, of course, for what Heath tells us of Manasse: “[as of 1985] he was the only Greenlander who could perform all of the rolls, braces, and rescue maneuvers that Greenlanders have developed over many centuries” (1990, page 10). Nissen gives an astonishing statistic for rolling as it was practiced in Greenland in 1911, “just before the dramatic decline in the use of kayaks in Greenland and throughout the Arctic.” According to the figures put together by a Hans Reynolds, only 867 of 2,228 active kayakers in Greenland (only 39%) knew how to roll. And this in spite of the fact that, as Nissen says, “rolling competitions and shows have taken place in Greenland as far back as anyone remembers” (2012, page 3). And, as I mentioned above, Chapman says of the Ammassalik people that “only about one in four of the hunters [could kayak roll]” (1934a, page 204).